This week I read a haunting novella by Uyen Nicole Duong about pre-1975 Saigon and Vietnamese exiles post-1975. 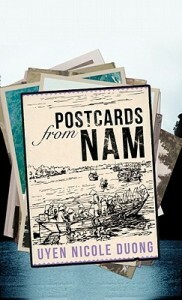 Postcards from Nam (Amazon Encore, 2011) is the third installment in Duong’s three-book series. A Harvard-trained lawyer, Mimi was living in Washington, DC, in her twenties when she started receiving handmade postcards from a mysterious admirer in Thailand named Nam. After consulting her mother, she realized this admirer was actually a childhood friend back when they lived in Saigon. She’d blocked out his memory after relocating to the US just after the fall of Saigon. 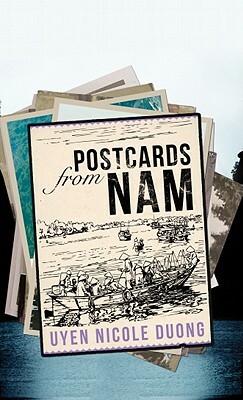 Nam’s postcards contained no return address, but Mimi reached into wide network of lawyer friends to track him down in a refugee camp in Thailand. She tried to connect with him. Then the postcards stopped. And then they suddenly started up again after Mimi moved to Houston. Nam had long left the refugee camp, but refused to join his family in California, preferring to stay in Thailand. With some help from her friends and mother, Mimi uncovered the tragic story of Nam’s escape from Vietnam several years after Mimi left. Postcards from Nam is a beautifully written story of one woman’s look into her past, and a friendship from long ago. Thanks for your comment! It’s a quick read, but the substance is definitely there, that’s for sure!